Not to mention the incredible support that Em gives along every step of the way. She's held my hand through all of it. I'm continuing to work with her once this programme wraps up because I actually can't imagine my business without her in it. The Step Up To 6-Figure course was incredible. In the first 3 weeks, I made over fifteen thousand dollars, and that was, like, unfathomable before because I had a limiting belief that I was not worthy of calling in money and abundance. But the moment I had paid for this course, I told the universe that I'm taking my business seriously, and I want to up-level, and as a result and with the tools from Emily, I was able to get to that next level. YES! You're in it, you're making it happen..
Something you once dreamed of! But something feels like it is starting to call you forward, to an even bigger game. Watch below to find out if this is the programme for you! Can you feel how juicy that would be? To be so proud, confident, courageous and focused... that you are truly SHINING? That's my mission in life, to get you to that place. You've already done one of the HARDEST PARTS! You've started. You've created momentum. You've got some clients. Maybe this sounds more like you? The rush of the initial success, excitement, those first few clients has worn off. You're now either full time in your business, or you know you're not far away. To a stable, consistent, 6-figure business. Maybe hire that first assistant... but oh my god… the thought of it freaks you out. "Will I be able to pay them?" "What work do I give to them?" "Can I really trust them?" Those were some of the thoughts I had when hiring my first team members! I want more of a LIFE! You're thinking about group programmes, transitioning online, booking speaking events, getting media. But just not sure WHERE TO START. I feel you. I have been exactly where you are now... In fact, it wasn't even that long ago. I had been building my business for a couple of years... ssslllooowwwlllyyy. Then last year, I got serious. I hired a coach, and set a goal to make $100,000 in my business! Cue 'How the hell am I going to do that?!' freak out. I was scared, I didn't really even believe I could do it. I mean, $100,000 ... me generating that... WHAT?! I didnt believe it. Then, right before the middle of 2017, I did it. Yep - I hit my 2017 goal, half way through the year! I then went on to do $200,000 in sales in 2017. DOUBLE what I planned to do... and about 3 x what I actually thought I WOULD do. All the while travelling the world for 1/2 of the year, going to Africa, Burning Man, Hawaii, LA, New York, Italy, Melbourne, Sydney, Brisbane... all the while working with EPIC, inspiring, powerful clients... who are all committed to changing the world with their work! More aligned, impactful and connected than I have ever, ever been. I know the desire you have for more. More Impact. More Freedom. More time. More opportunities. Look... if you're driven, passionate & looking to have your hand held privately by me as we leverage your business to finally allow you the lifestyle you have always wanted, then this is the programme for you. I just felt so supported and really deeply nurtured by Emily and the way that she carried out her own business that I wanted to be a part of it. And thanks to Emily and the Step Up To 6-Figures programme I am now so much more confident in my abilities to grow and scale a business and to be able to help more people in a way that feels really aligned. Emily brings together really powerful women in this juicy container, and I now have some amazing new friends who I am just so inspired by. I feel like, you know, I've really gone to the next level in my business but also in my life. Step up to 6-Figures is a 12-week programme where you and I, and an intimate community of Conscious Bosses, walk side by side laying the foundations for you to step into YOUR 6-figure business. Number of sisters for this programme is strictly limited. - Getting laser-focused on your business goals - we're talking income, community, reach, collabs, launching, sales, lead gen, speaking, programmes, all of it. If this sounds like YOU, and where you need support, hit the button below and let’s chat. You're a spiritually minded, passionate, Conscious Boss who is creating a business that is here to do good in the world. You care for others deeply. You crave adventure. Freedom. Expansion. Impact. You're looking to build a powerful tribe of collaborators, friends, and community around you and your mission. You're not that into 'things' yet you desire to be able to ramp up your lifestyle & self care, a few notches... To be able to take yourself for massages, facials (and take your besties too) because you know the best YOU is better for the world. You'd love to stay in a beautiful AirBnb when you travel, because you know beautiful spaces make you more productive and feel like the Boss that you are. Hell, even being able to travel and work in your business full time... yesss please! And the thought of business class... yeah, you deserve it, and that’s a mental shift we get to make internally too! You crave to feel that next abundance in your life, and you know that your business is the path to get you there. You're the Boss for me! I am now consistently earning a higher amount of money, I have consistent clients coming in but I've also up-leveled who I'm working with. I'm charging more, I've raised my prices, I've decreased the amount of one-on-one’s, I'm launching a group programme, I'm holding online masterclasses so all of these things that I wanted to do before but I didn't know how or I was too afraid, I'm now doing in my business and they just feel normal. "I jumped into her Bootcamp last year, and in that eight week period, I developed so much belief in my ability, and I got really clear on my vision and purpose. And that was the key for me in that first program, and then after that I decided I needed more, and I was really ready to take that vision and take that purpose and bring it to life, bring it to fruition. So since then I've been I've joined Em on her six-month Conscious Boss Bootcamp, and wow the growth that I have had in this six months has been phenomenal. So as I said, I didn't have a business when I first started the second Bootcamp with Emily and since then I've launched my business, I have launched my first online program where I had twenty two incredible women I helped transform. I've now set up another business with my current partner. 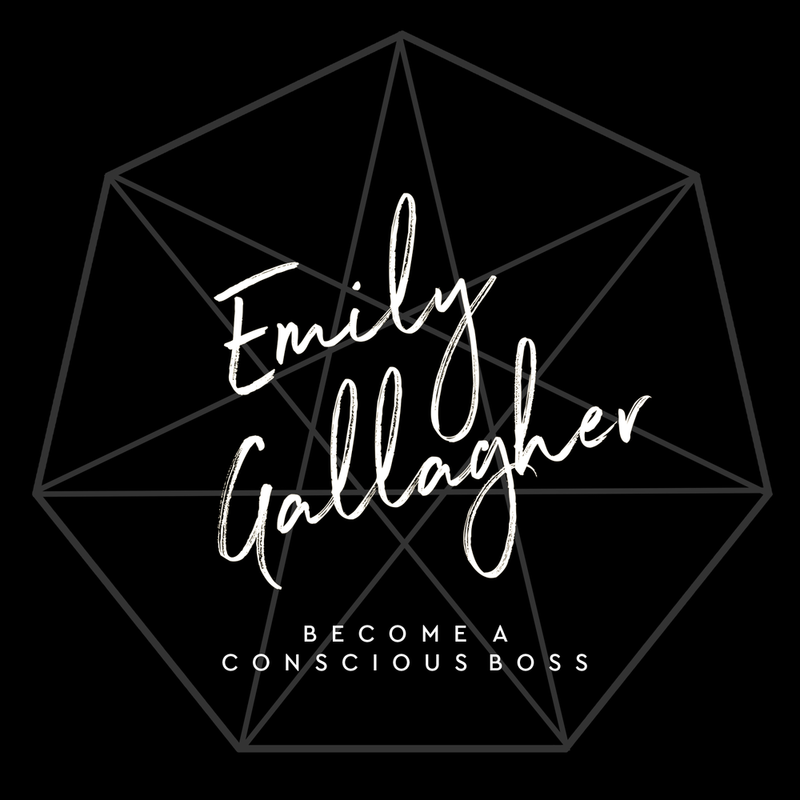 I've launched a second online program, I've got ten people in there at the moment, and I'm now launching my first spiritual awakening retreat in Bali which I'm super excited about in July, and a lot of that is credit to the incredible Emily and the container that she provides for the women that embark working with her and start working with her. Every week there is a module that provides so much value. She is always on board to support you in any capacity. She calls you out. She really does pull you forward, which she had to do a couple of times with me, but in a nutshell, she just... she just activates your potential, and she really accelerates your growth. And the other thing I love about Emily is she really embodies everything that she says. She's an embodied leader. She's integrated all the knowledge, the tools, and the wisdom that she's learned, and she's put into her work. She just gives and gives and gives. So whether you're coming into this program with, a business or a concept and you're not sure how to activate it and really, grow it or whether you're coming in brand new and you're looking to create something heart-centred and give back in some capacity, Emily is your girl. Jump in with Emily. She's changed my life in numerous ways. I'm so grateful for her, and I look forward to working with her again in the future, Em. Love you." " Working with Emily and the tools she gave me created huge shifts in my life and business in SO many ways! After hearing from a friend how much Emily had helped her with her start up business I knew I wanted to not only work with her but be part of the community she creates with Conscious Boss and her programmes. One year on my life looks completely different to how it was when we first began! After 3 months of stepping out completely from my beauty clinic I am now in the middle of selling that business and my home and will be travelling the world while being of service to women in a way that lights me up and brings me so much joy. This is the dream life I have always imagined for myself and I am so grateful! If you are stuck in a place where you want to be doing something more aligned in your work and coaching others is calling you forward, Emily is your woman to guide and help you create the abundance waiting for you." She is incredible so she truly helped me to take my business from zero figures, and I'm talking real zero figures to $5,000 in the first month of officially being a coach. Before working with Emily, I was somebody who was very confused, somebody who was very overwhelmed somebody who had a dream but didn't know how to turn it into reality. Since working with Emily and since undergoing the incredible training that she offers and I mean she covers everything guys everything you want to know about building a truly conscious business whether you are a coach whether you’re a service based wellness provider whoever you are out there if you have a dream you have a passion to truly create and do good in this world Emily Gallagher is your girl. I would happily and wholeheartedly recommend Emily Gallagher to everybody and anybody out there truly wanting to make a difference in this world and truly truly make an impact. If you are thinking about working with her, do it you will not regret it." "Since working with Emily, I quit my job at the end of last year and stepped into full time coaching. Since then I have been building my dream business. I’ve worked with numerous 1:1 clients, coached my first couple and I’ve booked out my first online program with 12 beautiful women which launches next week. Everything. Like literally everything has changed since working with Emily. My mindset, my business is booming and I am living my ideal life every single day. My confidence, belief in myself and my business mindset has completely shifted. My relationship with myself and my business has changed completely. I have this crazy belief in myself that I never use to have. I’m obsessed with building my business and getting comfortable with the uncomfortable. I feel like I can always count on her, she consistently shows up and adds values and goes above and beyond what’s expected. 100% work with Emily - she’s amazing! You will not regret it! She will show you what’s possibly for your life and your business and she will hold your hand whilst you make it happen. If you want these results for YOURSELF, hit the button below to share your goals with me, and book in for a complimentary discovery call.